BumChum T-shirt is made from soft 100% cotton fabric which is specifically selected for babies. The T-shirt has a envelope shoulders for easy wearing and removing , especially for really small infants.This T-shirt is also made with custom length so that it doesn't ride up every time a baby is carried. The T-shirts are made to match the Bumchum Diaper Covers. 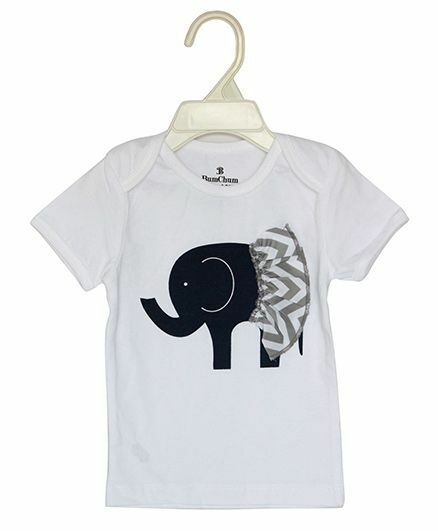 Styling Tip: Pair up this T-shirt with shorts or diaper covers to keep your baby comfy. BumChum was founded in 2011, by a mompreneur who has lived and worked in Australia and the US for close to a decade. BumChum was born out of her quest for a convenient, economical and modern diapering solution especially suited for India's hot summers. Our team is continuously working with designers around the world to create diapers that are easy to use and care for, keeping in mind the convenience of the Indian household. Our diapers are leak resistant, breathable and at par with American brands in quality of fabric and design. We love babies, and are constantly working on improving our products based on feedback from our customers.